NETWORK FINALS: Once again, there was no adjustment for WINTER OLYMPICS ratings. Elsewhere, the 9PM rerun of THE BIG BANG THEORY gained 0.1 in final numbers. CABLE HIGHLIGHTS: NBC Sports Net’s share of WINTER OLYMPICS coverage topped Thursday cable, with the primetime portion at 0.65 and late-night at 0.72. TNT’s NBA game was at 0.54. 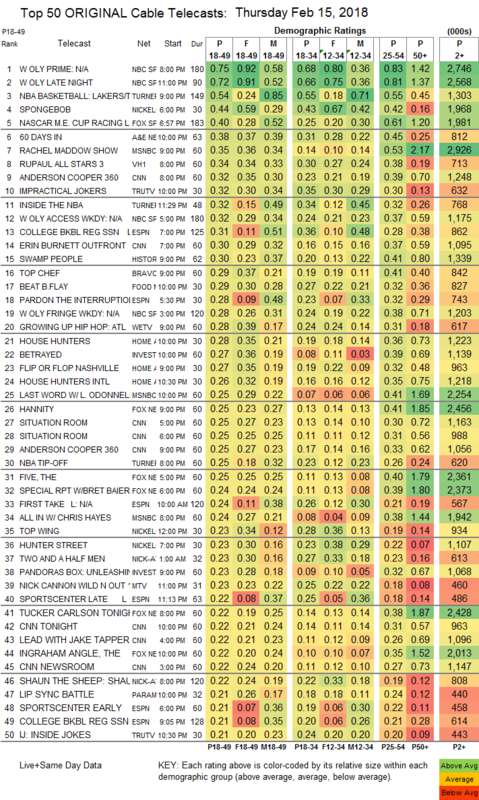 Nickelodeon’s SPONGEBOB continued to impress, landing the #4 slot for the day at 0.44. Fox Sports 1’s NASCAR race was at 0.40. On A&E, 60 DAYS IN rose 0.04 to 0.38. MSNBC’s RACHEL MADDOW SHOW led cable news in the demo at 0.35/0.53/2.9M, over CNN’s ANDERSON COOPER 360 at 0.32/0.39/1.2M and Fox News’s HANNITY at 0.25/0.41/2.5M. VH1’s RUPAUL’S ALL STARS dropped 0.05 to 0.34. Tru’s IMPRACTICAL JOKERS ticked down to 0.32, and INSIDE JOKES was steady at 0.21. ESPN’s COLLEGE BASKETBALL game was at 0.31. History’s SWAMP PEOPLE was steady at 0.30. Bravo’s TOP CHEF held at 0.29. On Food Network, BEAT BOBBY FLAY ticked up to 0.29. We’s GROWING UP HIP-HOP jumped a tenth to 0.28. On HGTV, HOUSE HUNTERS gained 0.02 to 0.28, FLIP OR FLOP edged up 0.02 to 0.27, and HOUSE HUNTERS INTL ticked up to 0.26. On ID, BETRAYED ticked down to 0.27, and PANDORA’S BOX was down 0.05 to 0.23. MTV’s WILD N OUT was at 0.23. Paramount’s LIP SYNC BATTLE rose 0.02 to 0.21. Discovery’s KILLING FIELDS lost 0.04 to 0.17. Freeform’s BEYOND doubled to 0.14. CMT’s NASHVILLE slipped 0.02 to 0.09. 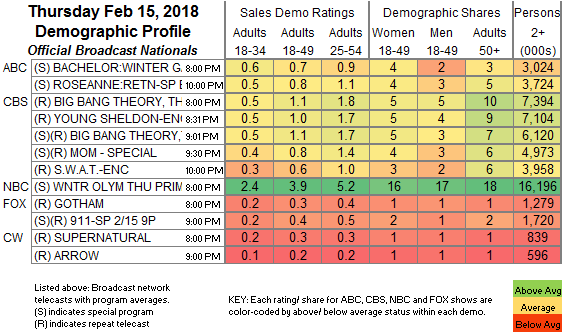 POP’s IMPACT WRESTLING ticked down to 0.07. IFC’s PORTLANDIA fell 0.02 to 0.03/124K.